Glyphosate is a major component of herbicide that is widely available in the market. Although it is said to be relatively nontoxic, ingestion of this chemical can be harmful to humans [1, 2, 3]. The chemical glyphosate is known as a broad-spectrum, non-selective plant killer. It achieves its intended effect by inhibiting protein synthesis in plants which inhibits the growth of these plants. The unwanted plants die within 4-20 days. Commercially available pesticides may contain about 41% or more glyphosate. Preparations used for domestic use contains only about 1% glyphosate. The LD50 of this compound in rats is measured as 5600mg/kg. This number tests the amount of chemical required to kill half of the test population and is a test used to compare the toxicity of chemicals. Individuals who apply this chemical must wear personal protective equipment due to the possible harm of exposure to this chemical. Eye exposure may cause a mild type of conjunctivitis and inhalation of this chemical may cause nasal discomfort [1, 2, 3, 4, 5]. How much is Glyphosate Toxicity? There are cases wherein people drank glyphosate chemicals in an attempt to commit suicide. It is said that ingestion of more than 85ml of the commercially prepared formula may cause toxic symptoms to a person. The age of the individual may increase the risk for glyphosate toxicity. Children and the elderly may have increased sensitivity to the chemical and may experience symptoms at a lower amount [1, 2, 3, 4, 5]. What are Glyphosate Toxicity symptoms? The symptoms of glyphosate toxicity after an ingestion are primarily due to its corrosive effect in the gastrointestinal system. The person may also experience dysphagia and epigastric pain. Respiratory distress may occur and cause hypoperfusion of organs. If this is not managed immediately, this can lead to the failure of the liver and kidneys. Other symptoms that may be present include pulmonary edema, irregular heart rate, increase serum potassium, metabolic acidosis and shock [1, 2, 3, 4, 5]. 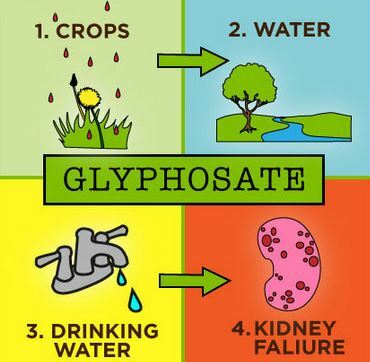 The focus of the management for glyphosate toxicity is to reduce the amount of chemical in the body and manage the symptoms that have developed. A dose of activated charcoal may be given or a gastric lavage may be performed if the patient present in the hospital in less than an hour after the ingestion had occurred. Like in the management of a toxicity in calcium channel blockers and beta-blockers, intravenous fat emulsion can be performed as well. The amount of glyphosate in the blood is measured regularly throughout the therapy to identify the response of the patient to the treatment. Those who have intentionally ingested the chemical may be referred for a psychiatric evaluation to prevent this from occurring again in the future [1, 2, 5]. How to prevent Glyphosate Toxicity? Preventing an overdose in glyphosate chemicals starts in the proper storage of the compound. They shouldn’t be left unattended and they should be kept in a locked cabinet to prevent access especially by children. Personal protective equipment must also be worn when using this chemical to avoid skin contact, inhalation and eye exposure [1, 4, 5]. An overdose in glyphosate can be dangerous and it should be prevented at all times. Any more information about this condition can be shared in the comment section below. Mahendrakar, K., Venkategowda, P. M., Rao, S. M., & Mutkule, D. P. (2014). Glyphosate surfactant herbicide poisoning and management. Indian Journal of Critical Care Medicine, 328-330. Bradberry, S. M., Proudfoot, A. T., & Vale, J. A. (2004). Glyphosate poisoning. Toxicological Reviews, 159-167.